The MiRHook 200 increases the efficiency of internal transportation tasks. 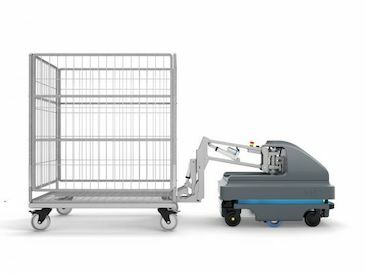 It’s a user-friendly mobile robot for fully automated towing & pick-up of carts in production, healthcare & logistics. How Can the MiRHook 200 Improve Your Facility? The MiRHook 200 is ideal for a wide variety of towing jobs. It can efficiently move heavy products between locations in a manufacturing & healthcare facility or warehouse. The robot autonomously transports loads up to 1100 lbs (500 kg) that you define, identifying carts by QR codes. It can be incorporated into a fleet of MiR robots and redeployed to meet changing requirements. No prior programming experience is needed, and updating the robot’s mission can easily be done at any time via smartphone, tablet, computer or Bluetooth connection. Once you measure your cart and upload the data into the MiRHook 200, the built-in sensors, cameras & software allow the cart to safely maneuver around people and objects, and it can also drive up ramps.